So today was a great Saturday. We stayed at home all day long, and I baked 3 different things — Scones, Bread, and Brownies! Well, actually I didn’t bake the brownies, our friends Ricky and Apple did. At first, they just wanted to “help,” but armed with the recipe, I thought it would be a good time for them to learn something new. Chinese don’t bake. Most don’t have ovens. So, making western brownies isn’t something most people know how to do. They had a great time learning, and I did supervise a bit, so the end result was perfect! They were quite proud of themselves… Apple commented that they were better than the ones her teacher made her! Apple is a student in the language school operated by our organization (not related to the foster home), and Ricky is a Chinese volunteer in the language school… he helps translate for the students and teachers, but he also gets to practice his English. Ricky is one of our closest friends here in China, but he’s going home to his hometown in southern China later this month. So sad. So, we’ve been having him over a lot for dinner lately to spend time with him… tonight we had homemade chicken noodle soup, foccacia bread, and their brownies! Yum. 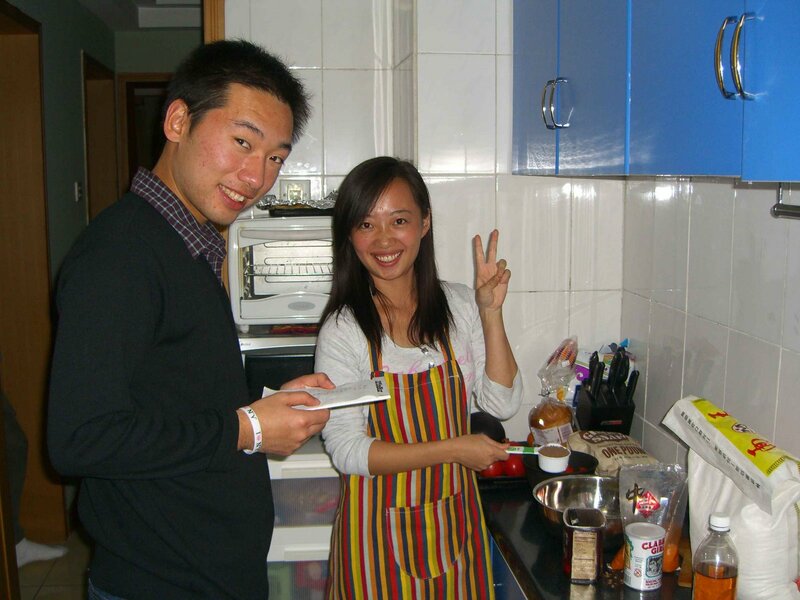 Another recent friend we made is from Tibet, who was doing some training at the foster home. He and his other friends stayed in the apartment next to us. One night he got locked out, and his friends were still in Beijing. As a result, he hung out with us for about 2 hours. Which was excellent Chinese practice, since he didn’t speak English! We actually learned quite a bit about the province that we didn’t already know, and it made us want to visit even more. We hope to make it out there sometime next summer. They gave us a long white scarf, a traditional “friendship” (as best as we can understand) gift from their culture. This visit didn’t involve food, but it did involve at least one joke by our new friend about Jacob enjoying food… so it is still relevant to the post. And, for no other reason than that they are just plain good… here is our scone recipe! I can’t claim it… Majaunta, Jacob’s mom, is the one who passed it along to us. They are not for the calorie/fat-conscious, but boy are they yummy!!! Let me know if you try and like them! Cut 1/2 Cup of softened butter into dry ingredients with fork; add 1.5 C. (less 2 Tblspoons) of heavy cream. Mix well (knead a bit). Roll out to 3/4 inch thick. Cut into desired sizes and brush with remaining cream and sprinkle with sugar before baking. Bake at 375 until just turning golden… in our “easy bake oven,” that’s about 10-15 mins… but it could be much faster in a normal oven. Hope you enjoy! They are sooooooo good! I love it that you are making such wonderful friendships. Brownies in China! Awesome! Oh how fun!!!! What sweet friends. Congratulations!!! ONE YEAR! What love you have given and seeds planted! PraisesThank you for the sweet reminder of His yolk! Your passion is contagious!!!!!!!!! !Much love and many prayers!